So here she is, the fourth yarnie for Strickmich! 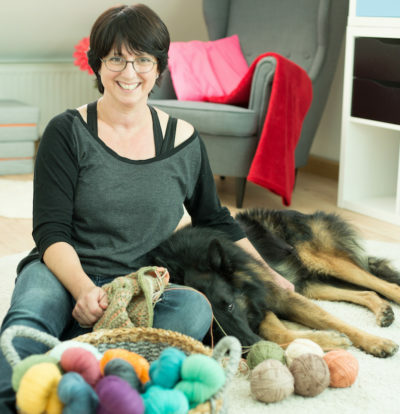 Club 2019: Maike Schnichels and her yarn collection "Skudderia". 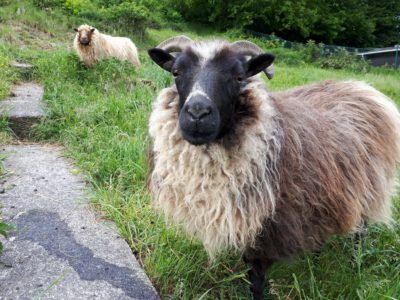 Skudde is the name of a rare middle European sheep breed, and Maike happens to have five of them grazing in the meadow behind her dyeing studio close to Frankfurt – for obvious reasons: "It's really hard to mow here, and I had seen these pretty sheep with their spectacular horns, so I decided to get a couple of them", Maike said. Maike learnt to dye during her training as a hairdresser. "That has always been the fun part: Finding the colors that look good on people and help them choose." In her little salon in Frankfurt-Bornheim, she started dyeing yarns in the small kitchenette in the back. It did not take long until her salon looked more like a yarn store with a hairdresser's chair in the middle. 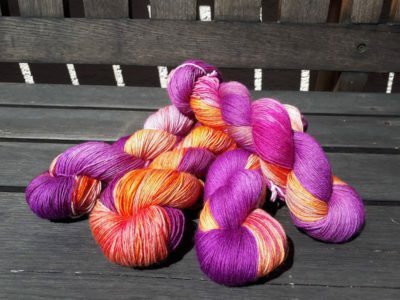 "When I started out, I used lots and lots of colors on each skein. But then I started talking to knitters and asked them what they would like and need", Maike said. 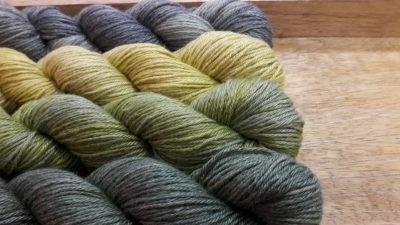 It turned out that many knitters were asking for hand dyed semisolids that were easy to combine and useful for making large shawls and garments, so Maike went on to specialize in those. "I really enjoy making kits out of differently colored yarns and I love to help knitters find the ones that suit them best", she said. 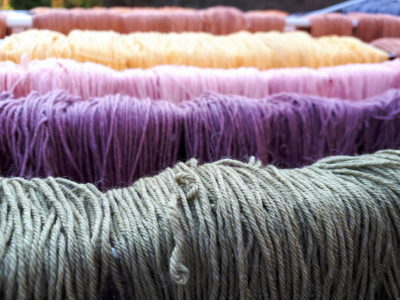 If you happen to visit her booth at a fiber festival, she will help you pick the right colors for your project among a wall of beautiful colors, all dyed on special yarns made from natural fibers, among them exotic ones like Llama fiber or a lace yarn out of linen and alpaca. 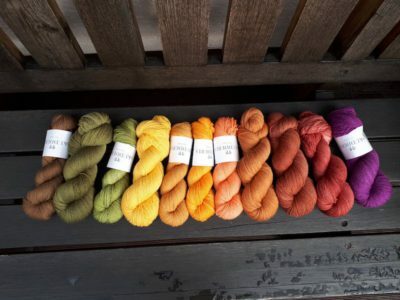 Maike obviously loves to knit projects that make use of several shades of her hand dyed yarns: "I love shawls, they are easy to take to fiber fests and show them to customers. I would love to knit garments, but I have lots of respect for those and have not really found my way to start one..." Her favorite colors to knit with are blues and teals: "Turquoise, mint, bright pacific blue – that's what I love most, but now in the fall I also like mustard, a rusty brown and bright green", Maike said. 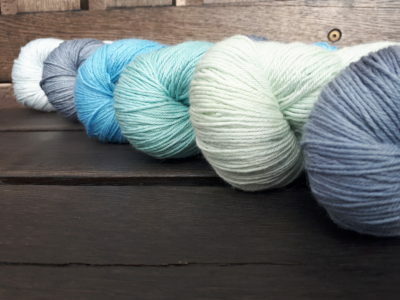 In Summer 2018 Maike made two important decisions: She closed her little salon to focus entirely on dyeing yarn, and she renamed her brand "Skudderia". Until then, she used to offer her creations as "Regenbogenschaf" ("The Rainbow Sheep"), but she felt this name was not a good fit anymore: "I have learnt a lot as a dyer and developed my signature style, and I felt that I had grown out of the cuteness that the old name suggested", Maike said. Here at Strickmich! Club we are happy that Maike decided to celebrate this new step in her dyeing career with a new exclusive color for our members. We're excited to have you!